In December this year there will be a UN climate change conference in Paris. Scientists and environmentalists have said that this is the last chance for governments to act to keep the increase in global warming to within 2 degrees. The effects of a 2 degree rise in the temperature of the atmosphere are serious enough, but rises above this level will increasingly threaten human life on the planet. Increasing population and increasing consumption have caused global warming by the continued burning of fossil fuels such as coal, oil and gas. Global warming is causing more extreme weather, droughts and reduced crop yields, more wildfires, rising sea levels and flooding, loss of sea ice and glaciers, changes to the range of animals and plants. But increasing population and consumption have had other consequences as well. The resources of the planet that we rely on: the forests, rivers and lakes, the seas and oceans, the diversity of wildlife, the soils and minerals, are all being depleted or destroyed. The current world population today is 7.35 billion (considered by some environmental scientists to be already two to three times higher than what is sustainable). This is projected to reach 9.6 billion by 2050 (and it is not expected to level off as previously thought). And humans are living in increasingly crowded and polluted cities in a state of growing inequality and scarce resources. Desertification and conflicts over water scarcity and land grabs are leading to increased migration. The over-consumption of food, fuel, building materials, and manufactured goods in developed countries has played a major part in the depletion of the earth’s resources, but people in the developing world understandably desire the same things: more and better housing, heating and lighting; more cars and roads, more electrical goods, more shops and malls, more food and more meat, more flying as people want to travel overseas, and so on. An obvious example is China. China today has 78 million cars. If China was to have as many cars per person as in Britain (approximately one car for every two persons), then the number of cars in China would increase ten-fold to 705 million. This alone would require the current number of barrels of oil produced in the world today to increase from 87 million a day to 132 million a day. To build this number of cars (and to build their replacements when they become obsolete) would require a dramatic increase both in the materials that would have to be extracted from the earth, and of the energy required to build them. Also to be considered are the additional roads that China would have to build and the effect of a huge increase in pollution in its cities, many of which are already heavily polluted. It is self-evident that the resources of the earth on the planet are finite; our exploitation of those resources is unsustainable. With the UK general election taking place on 7 May, are people in Britain aware of these issues? How do people find out what’s going on in the world? And so for the first time, adults are more likely to access the internet or apps for their news rather than newspapers, 41% compared with 40%. In any case, you will read very little about what is happening in the world, let alone the issues referred to at the beginning, in tabloid newspapers in Britain, and I don’t think that you will much about them either in some of the broadsheet newspapers. So newspapers are no longer so influential. 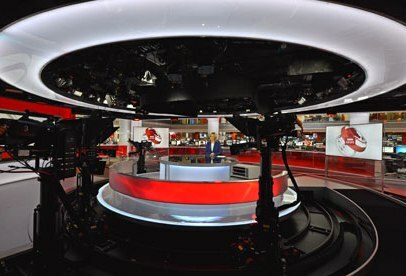 Television and websites are now the main sources of news for the majority of people, and the effects of global warming and environmental issues are covered by these media, though the depth of the reporting is extremely variable. But these global issues are overwhelmed by other hard news such as the economy and jobs, housing, the NHS, education, crime, immigration, welfare and pensions. What are the issues that voters are most concerned about? 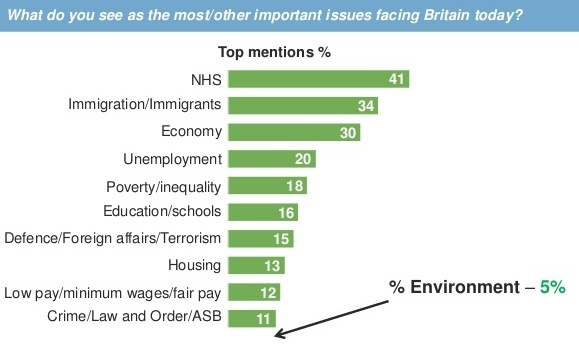 These are the most important issues facing Britain today according to an Ipsos MORI survey of a 966 British adults between 6th and 15th February 2015. Pollsters have been out and about trying to find out the issues that voters are most concerned about. When it comes to global warming and sustainability, the issue doesn’t seem to come up at all. The nearest seems to be the vague ‘care for our environment’ or the all-embracing ‘environment/transport’. This may be because pollsters have pre-determined what should be on the list of issues that voters are asked to rank as ‘very important’ or ‘fairly important’. Of course they might be right: that it isn’t on their lists as global warming is not a priority issue for most voters. But it is not as if the threat to the human race is below the news radar. On Wednesday this week, the Independent reported climate scientists as saying that there is now is a one in ten risk that atmospheric temperatures could increase by 6 degrees by 2100. This would lead to cataclysmic changes in the global climate with unimaginable consequences for human civilisation. Would you fly on an aircraft if there was a one in ten risk of it crashing? Are we all keeping out heads in the sand. Is it a case of tomorrow being just another day? What are the political parties going to do about global warming & sustainability?